A madman named Blyth is kidnapping the beings of a thousand star systems for nefarious purposes and has hired the bounty hunter Lobo to keep his captives subdued. The good news is that a new Justice League is aware of the situation. The bad news is they're currently stranded on the distant planet Rann. And even with Supergirl having stumbled across them and Hawkman launching a one-man rebellion from within Blyth's prison, it still seems that the new Justice League's tenure is over before it truly began. I love this book so much. And it is almost entirely due to how Jeff Lemire writes my favorite heroes. Specifically, how he can portray them as being competent in a fight but still let the humor of their personalities conflicting with one another come through in a believable fashion. 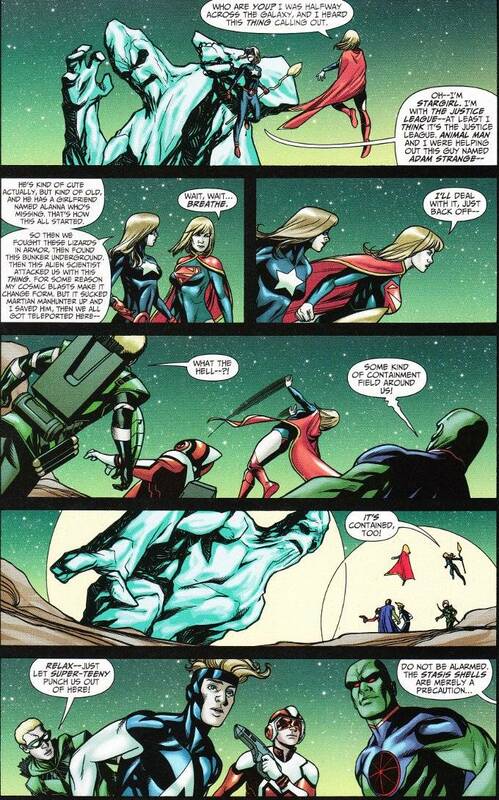 This is most apparent in the snarking between Green Arrow and Animal Man, but it also comes through in Stargirl's first encounter with Supergirl. 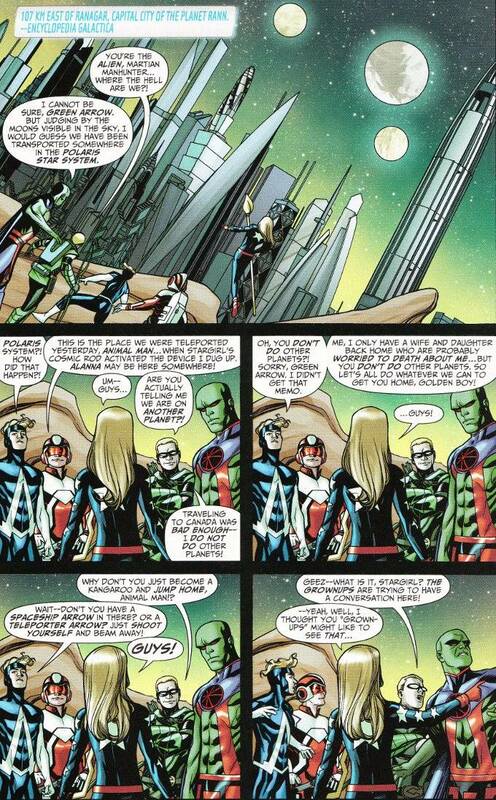 And there is one glorious but amusing sequence where Martian Manhunter gets a laugh-inspiring moment as he deals with a group of Rannians who have threatened to imprison him indefinitely. Unfortunately, I don't think the artwork is quite up to par with Lemire's story. Mike McKone's artwork isn't bad but - as in the first issue - he is not above recycling panels. A larger problem with this issue is the inking, which was overseen by three different inkers including McKone. As a result, there are noticeable and distracting differences in the individual pages, with some seeming to have barely gotten any inking besides a black outline around individual characters!